Why: Because a well-trained dog is a plea­sure to have in your home, a plea­sure to travel with, and is wel­come most any­where. What You Learn: We’ll be work­ing on a vari­ety of basic, good man­ners: Polite Greet­ing, Sit, Down, Polite Walk­ing on Leash, Come, Go to Bed, Tar­get­ing, Off/Leave It, etc., and some fun dog tricks! We also dis­cuss other dog behav­ior chal­lenges accord­ing to dog training classes need/interest. Please remem­ber that first ses­sion of class is “with­out” dogs. 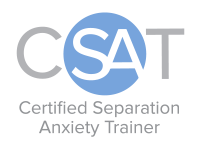 This gives us a chance to dis­cuss train­ing phi­los­o­phy, moti­va­tion and tim­ing, gather expec­ta­tions, dis­cuss clicker train­ing, items for you to bring to remain­ing dog training classes, etc. There’s lots of infor­ma­tion for you, the han­dler, to learn before the dogs join us in class. Why: To give your puppy the best pos­si­ble start in life and to make sure that your puppy has “pos­i­tive expe­ri­ences” with all of the new peo­ple, places and things they encounter. Did you know that the most for­ma­tive time in your puppy’s life is the first few months? It’s very impor­tant that you social­ize your puppy to a vari­ety of peo­ple, places and things dur­ing this win­dow of time. What You Learn: How to set your puppy up to be a well-mannered, con­fi­dent, adult dog. This class is for pup­pies who are 9 to 16 weeks of age at the start of the first class. We’ll be helping you learn about proper social­ization techniques for your puppy (espe­cially in regards to chil­dren, men, and strangers) and other dogs, as well as teach­ing basic good man­ners such as Polite Greet­ing, Sit, Down and Come, and real life skills such as Drop It and Leave It. 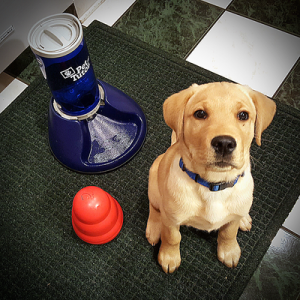 Our goal is to set your puppy up to be a well-mannered, con­fi­dent, adult dog. It’s a great head start to our Family Man­ners 101 class. Require­ment: Pup­pies should receive a min­i­mum of one set of vac­cines at least 7 days prior to the first class and a first de-worming, and should be kept up-to-date on vac­cines through­out the class. What You Learn: We’ll be working on a variety of basic, good manners. Polite Greeting, Sit, Down, Polite Walking on Leash, Come, Go to Bed, Targeting, Off/Leave It, etc., and some fun dog tricks! We also discuss other dog behavior challenges according to class need/interest. Please remember that first session of class is “without” dogs. 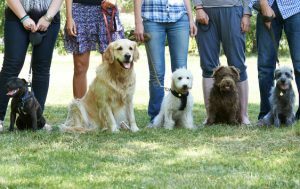 This gives us a chance to discuss training philosophy, motivation and timing, gather expectations, discuss clicker training, items for you to bring to remaining dog training classes, etc. There’s lots of information for you, the handler, to learn before the dogs join us in class. Your dog should come to class wearing a flat buckle or snap collar or a front-clip harness, and a 6-foot leather or nylon leash. No choke chains, prong collars, shock or electronic collars. This kind of equipment is not needed or permitted because it conflicts with our core principles. We also ask that you leave your retractable leash at home for your dog’s protection and the safety of others—and for better training results, too! We will miss you if you are unable to attend a class or classes after registration. In order to keep class sizes small we are unable to refund or discount missed dog training classes. Schedule permitting, we can arrange a 30 minute make up session on the day of your next scheduled class for $25. Please contact us for more details. Every person and dog are different, so we make sure you get plenty of time with your instructor. We train with a clicker—a small communication tool that bridges the gap between species and speeds canine learning. Our friendly dog professors strive every session to create a good time for all—because learning happens faster when you’re having fun. We want you to see change in your dog where it matters most—outside our classrooms in your home, neighborhood, and wherever you enjoy taking your dog. Dogs don’t understand English—a constant source of frustration for us humans. We use a small hand-held box called a clicker to help bridge that communication gap. The small click sound tells your dog he’s got something right and helps him learn his new skills much faster. Fun Fact: Clickers were first used to train dolphins and other marine mammals who couldn’t easily be put on a leash, and who could simply swim away if they didn’t like a harsh training method.